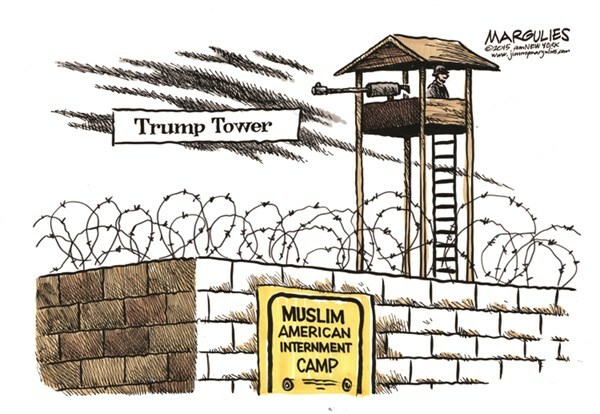 Trump continues to use fear appeals and scare tactics when it comes to Muslims and terror. And while he is minimally effective – and getting less so every day – his supporters are sympathetic others who are increasingly misinformed about terror and Islam. A piece of video footage showing Trump supporters at a rally had one fellow screaming at another that Islam was an “ideology.” The point was that Islam is a nefarious set of beliefs and practices designed to manipulate you into its belief system. The dilemma here is that defining Islam as violent justifies an armed response when, in fact, the only response that will be effective is a long-term war of ideas pitting *Islamist extremism against liberal democracies. As Gutmann and Thompson have claimed in their highly recommended book Democracy and Disagreement,“of the challenges that American democracy faces today, none is more formidable than the problem of moral disagreement.” In other words, those who have sacred values and are what Scott Atran calls “devoted actors” rather than “rational actors” pose the biggest challenge to liberal democracies because conflicts over fundamental values are so resistant to resolution. You cannot simply subject the moral disagreement to the rational calculations of the marketplace. But if wanton murder of men, women, and children is so fundamental to Islam why is it such a recent phenomenon on the world stage? Why doesn’t “jihadism” as it has come to be known have long history? Typically, Islamist terror is first associated with the 1979 Iranian revolution. But even the Iranian revolution can be analyzed as a clash of political ideologies where Islamists attach themselves to religious sounding terminology (“infidels,” “holy wars,” “party of God”) in order to give themselves religious justification. “There is in the history of Islam no precedent for the utterly unrestrained violence of Al Qaeda or Hezbollah… To kill oneself while wantonly murdering women, children, and people of all religions and descriptions… has nothing to do with Islam and one does not have to be a learned theologian to see this… The truth is that contemporary Islamist terror is an eminently modern practice thoroughly at odds with Islamic traditions and ethics” (p.6). I don’t mean to imply that traditional Islamic religious teachings hold an inclusive democratic vision for the world or that it resonates with contemporary ideas about liberal democracies and human rights. But the long view of any religious evolution has it moving toward a widening circle of inclusion and dignity for others. As of now, there are more than a few Islamic countries that are pluralistic but have no political concept of “pluralism.” For this reason they define rigid group boundaries and more nascent forms of control. But as with most of the issues in this election, Trump is not the answer to anything. *Terminology note: I use “Islamist” or “Islamism” to refer to those extreme groups or ideologies that justify violence and cherry pick the Koran to give their ideology a religious sounding façade. The term “Islamic” refers to the long political, religious, and scholarly tradition of institutional Islam. Is this the Muslim Martin Luther? The below was first posted in March of 2014. Thought it would have new interest given events in Turkey. The photograph above is of Fethullah Gulen who Victor Gaetan writing in Foreign Affairs compared to the Muslim Martin Luther. Interestingly, I have been writing a little bit about Gulen recently in a book that I’m finishing up and during my research I had become a little intrigued with Gulen. You can find the article in Foreign Affairs here. A typical descriptive statement about Islam over the last decade is that it never experienced a Reformation. It is true enough that Sufi-ism and scholars such as Said Nursi inspired new more humane schools of thought but they remain marginalized. Much of Islam, not all, is harsh and rooted in the political and military conditions of the ancient world and there has never been a moderation of these tenets by a Muslim Martin Luther. There has never been a Muslim Reformation. Martin Luther was an influential and controversial figure in the Christian Reformation movement. He was responsible for entire new lines of thinking in Christianity and set in motion a sort of enlightenment. Luther had a desire for people to feel closer to God and this led him to translate the Bible into the language of the people, radically changing the relationship between church leaders and their followers. Martin Luther is generally associated with rooting out corruption, preventing religion from being used as a tool for political power, and humanizing the church his anti-Semitism notwithstanding. 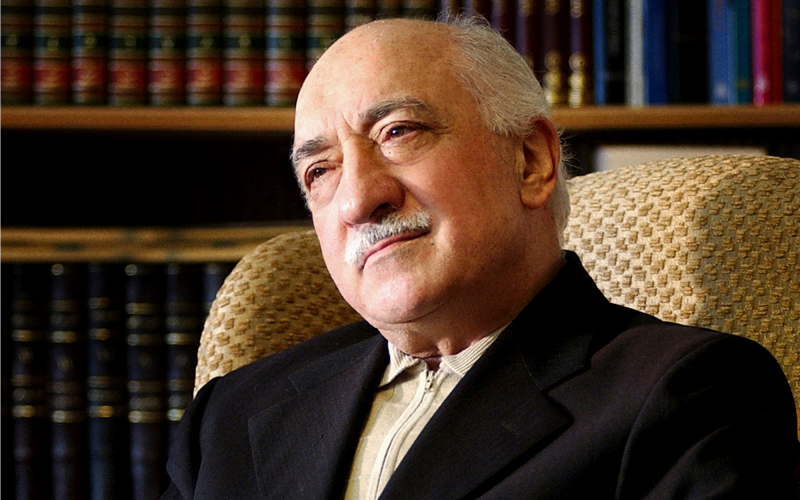 Even at the risk of exaggeration, many feel the contemporary version of the Muslim Martin Luther is Fethullah Gulen. Gulen is a Turk who has been in the United States since 1999. He has worked to promote a modern school of Islam and is an Islamic intellectual committed to secular education, economic development, democracy, and acceptance of scientific knowledge. Gulen has taught that Islam should devote more energy to public service and be separated from politics as much as possible. His emphasis on helping others and doing good deeds in the community is consistent with much Koranic teaching and directs attention away from political organization. This is in sharp contrast to the Muslim Brotherhood whose ascendancy in the last half-century has argued that the state should be Islamic and armed struggle is a moral and spiritual obligation. Moreover, Gulen is committed to education, including science and math, and has over 1000 schools around the world with video and instructional material made easily available to students. As you might imagine, Gulen is not popular with modern-day Islamists. He has been exiled in the United States for many years and clashed with Erdogan over foreign-policy and authoritarian politics. Gulen is a strong supporter of democratic dialogue and he has chastised Turkey and other Islamic countries for poor treatment of journalists and a failure to engage sufficient constituencies over issues such as the Gezi Park protests. The Gulen movement upholds numerous liberal conditions such as the belief in the intellect and the fact that individuals are characterized by free will and responsibility to others. Not all of Islam divides the world up into categories such as dar al-harb (the house of war) and dar al-Islam (the house of peace) but understands humans as more coherent and integrated. A verse in the Koran states that “there is no compulsion in religion” which emphasizes the individual intellect and freedom of choice. Gulen is both careful and brave. He will not be intimidated and continues to speak up even in the face of the easy violence that could confront him. While Erdogan continues to clamp down on Turkey with Internet censorship and control of the judiciary, Gulen continues to infuse Islam with the teachings of tolerance and democratic sensibility. It is already the case that it will have taken the US longer to defeat Al Qaeda and ISIS than it did Germany and Japan. There are two reasons for this. The first is the tendency to blame the United States for these problems, and the second is the role of religion in foreign policy. I find the argument that the US is responsible for ISIS and we are reaping what we sow to be indefensible and a rather weak argument. Here’s how the current litany of arguments blaming the US goes: ISIS is George Bush’s fault because of Iran. The Taliban are Ronald Reagan’s fault because we armed them to fight the Soviets. The splinter groups in Syria and Yemen are offshoots of Al Qaeda. The PLO, Hezbollah and Hamas are Israeli creations all because of the occupied territories. The jihadists in Libya are our fault because we supported the overthrow of the vicious dictator Qaddafi. I suppose I haven’t heard an explanation for how we are responsible for Boko Haram but I’m sure someone can construct one. We seem to be engaging in “post hoc ergo propter hoc” fallacious reasoning such that the existence of a terrorist group is looking for a cause and pointing to some prior act of United States. America apparently has more influence than Islam even though jihad has a long history and every Middle Eastern slight gets easily interpreted as caused by Europe or the West. There are more than a few motivations that have their basis in religious imperatives that existed before the United States did. I accept that there are two sides to the argument about the legitimacy of the war in Iraq and related terrorist activity, but there’s a difference between justification for the war in Iraq and its prosecution. WMDs (nuclear weapons) are one day going to be responsible for catastrophic destruction. The US is going to have to remain diligent and aggressive to prevent a mushroom cloud over New York City. And this is not hyperbole. The most likely political entities to make them available to terrorists are Iraq, Iran, North Korea, Pakistan. Stopping their potentialities in Iraq or anyplace else before they’re able to be used elsewhere is sensible policy. The levels of violence, organizational structure, and ideology associated with Al Qaeda or ISIS is beyond the capabilities of the United States. Even if United States is implicated in the creation of a few of these groups claiming that we are directly responsible seems to be quite a stretch. And if Bruce Hoffman’s predictions are correct then ISIS and Al Qaeda will merge and the US will be the only “answer” to the problem rather than its cause. The second reason Al Qaeda and ISIS are so difficult to defeat is the role of religion. This is, of course, a large issue and we can address it more fully at another time. But Jacob Olidort explains how soft power and attempts at democratic and rational conflict management are no match for the pull of theology and religion for ISIS and Al Qaeda followers. Salafism and other tenets of Islam provide a theological basis for jihad and other relationships between religion and politics. The United States is in no position to challenge the theology of ISIS or Al Qaeda when in fact this is exactly what must be done. Foreign policy rooted in religion make problems more recalcitrant and difficult to manage. Religion makes the actors on both sides more “devoted” than “rational” as Scott Atran explains. This makes them less subject to a shared an intersubjective reality that one day can provide the basis for common ground. Muslims, for a lot of obvious reasons, have been the recipients of hate crimes and this is quite unfortunate. In addition to old-fashioned violent hate fueled by fierce emotions there is the more benign form of hate that simply tries to dispute Islam’s status as a religion. This is usually the territory of the more educated who are able and patient enough to do close analyses that they consider to be insightful with respect to the “true” nature of the religion. One example of this is Bill Warner who has written about Islam and lays out a rather thorough analysis about how Islam is not really a religion but a political system based in force. Warner thoroughly rejects Islam as a religion and describes it as “warlike,” and concerned predominantly with “annihilating civilizations.” You can watch an interesting video of Warner explaining his position here. Warner masks his extreme hostility to Islam in academic images of critical analysis. He refers to Islam as not coming from the tradition of critical thinking but one of authoritative thinking. He states clearly that Islam is nondemocratic the supply and its alien stance toward the West. Warner’s analysis is really quite skilled in that he denies the concept of the “golden rule” in Islam because Muslims, according to Warner, do not believe in equality for all. Rather, they believe in equality only for a few and how you are treated depends on what groups and social class you belong to. His “golden rule” example is an appealing comparison that the average reader can relate to. Warner goes on to state emphatically that Islam is primarily interested in destroying civilizations and conquering the world. His arguments play nicely into the hands of those prepared to receive them. Another hate strategy for anti-Muslim groups is to portray them as strange and alien. Prayer and worship are fundamentally different than the Judeo-Christian tradition and are typically associated with negative traits. Muslims are portrayed as aggressive, irrational, and unsympathetic to violence, child marriage, and the roles of women. Clearly Islam is associated with terrorism and understood as a justification for terrorism. A study on the relationship between hate crimes and terrorism found that a crimes or violence against a group like Muslims do not necessarily lead to or predict terrorist activities. Still, anti-Muslim groups believe that Islam is a danger to the United States and typically think of Muslims as a fifth column waiting in the wings to damage American democracy and Western civilization. Their fears are accompanied by paranoia about population growth that will one day overwhelm majorities. Finally, Muslim hate groups characterize Islam is an evil religion capable of great violence and hate itself. 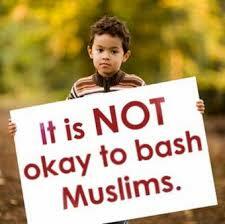 They presume that Islam has no core human values and is inferior to the West. The Southern Poverty Law Center produces the hate map which identifies various hate groups in different states in the United States. The hate map is an important source of information because people can be easily misled by the skilled rhetoric of those who speak for these groups. Additional Muslim hate groups have been identified and had their rhetoric and strategies exposed. Hate is an extreme emotion capable of great violence. Yet, I recognize that Islam is currently in the grip of a violent force in terms of Jihadis who do have a violent doctrine with vicious capabilities. But clichéish as it sounds this strand of Jihadi violence is not the essence of Islam. We are not in the midst of a battle for the soul of Islam, but perhaps for the influence of a particular path. Anti-Muslim hate groups must not win undue influence. Everyone has seen the images of the poor fellow on his knees with the hooded executioner standing over him. The imminent death of the captive is sufficient existential horror, as we all have a momentary absorptive identification with what it must be like, that moment, but the real focus of our identification is the violence made visible by the idea of a severed head. There are many quick and efficient ways to kill somebody, especially in the modern era. Then why behead someone? ISIS and like extremist groups are skillful users of media and savvy about manipulating images so they know that beheadings have a long history and carry a symbolism that resonates not only with Islamic traditions but captures the attention of the audience. The beheadings may be part of Islamic true believer’s traditions – of which I will say more about below – but they also hold a special horror in the West and have a long tradition of literary and artistic representation. Since beheadings are not the most rational or simplest way to kill somebody, they must carry extra social significance. Moreover, “ritual” beheadings are particularly symbolic and infused with cultural symbols. 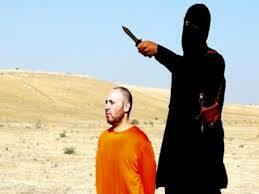 Beheadings, in fact, constitute a system of meanings that serve strategic as well as internal group purposes. It is always is difficult to draw a line from religious and cultural precepts to contemporary events. But it also is a mistake to pretend that these things don’t matter. Perlmutter, in her explication of honor killings and ritual murder, begins with a basic Islamist tribal code originally designed to recognize proper social values, establish differences between right and wrong, and bind the community together. These evolved into Sharia law and have maintained their tribal commitments to ancestry worship, solidarity, purity, and powerful ingroup-outgroup mentalities. It is purity that is most associated with the evolution of the moral code and this is true in most fundamental religions including Orthodox Judaism and Christianity as well as Islam. But Islamism in particular observes moral and purification rights by establishing prohibitions and practices on everything from dietary laws to sexual behavior. Ritualization inculcates these principles into the social unit and assists with learning and repetition. When an individual is afforded status or respect in the group it is because he or she is representing honor and adherence to the code. Dishonor and humiliation are to be avoided and when they are present in an individual or the community, then restoration in the form of vengeance is called for. Beheadings are form of vengeance and restoration. As Perlmutter explains, ritualized killing of enemies is even more barbaric than honor killings because the enemy represents the threat of eradication. A beheading is a masculine response that restores honor because it is particularly vile but represents the group as brave, powerful, and heroic. Westerners may not recognize it, but the hooded fellow standing over the debilitated and restrained victim is experiencing an orgiastic sense of power, status, and honor. In a symposium on violence, terrorism and Islam, participants made regular reference to “shame” cultures and the honor-shame continuum. Shame is associated with feminine qualities of weakness, defeat, acquiescence, and the loss of masculine identity. Shame requires a culture to move it more toward the honor end of the continuum and the shame is redressed by restoring masculine qualities such as violence. Shame resides in two places – the sexual organs and the face. One results in “honor” killings, and the other in the killing of enemies. The face is the focal point of human interaction and the location on the body that carries meaning, insights, and communicative expression. Beheadings, then, represent a strike at the core of one’s humanity and a form of mutilation that robs the other of manhood. In her book titled Losing Our Heads, Beheadings in Literature and Culture, Janes identifies five types of severed heads: venerated, trophy, presentation, sacrificial, and judicial, corresponding to five types of traditionally authorized beheadings in human culture. There is the ancestral head, removed after death; the trophy head, taken in warfare or raid; the sacrificial head taken from a living person by decapitation in the performance of a religious rite; the presentation head, taken in a political struggle to remove a contender or rival; and the public execution, proceeding from a legal decision. Beheadings, thus, are infused with meanings. They are the visible signs of deep cultural meanings and make manifest the inner workings of the culture. Knowledge of such workings is a crucial first step toward some sort of reconciliation, if not transformation. Are You Offended by This Picture? Are you offended by the picture below? Perhaps not but many people are. It violates a variety of moral foundations with respect to the interpretation of political messages (see a review here). 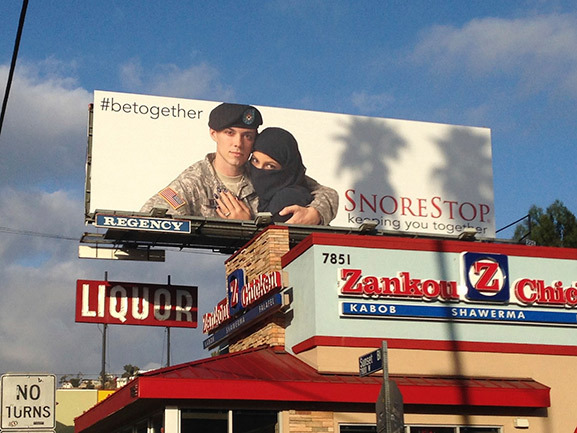 The photo is of an American soldier hugging a Muslim woman in a niqab. It is an actual ad inspired by a real couple. At first glance it looks like a political statement with respect to American forces and their concern for local citizens in Iraq or Afghanistan. But the billboard is an ad for a throat spray that is supposed to help people stop snoring and thus keep them “together.” The ad does successfully pass the first rule of advertising which is to capture attention. 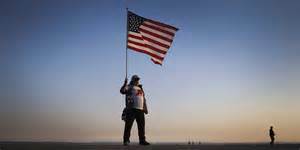 But for some people this togetherness is too soon after 9/11, and for others it is shoving political correctness down our throats. Others find the ad endearing. Some research did reveal that the soldier is real and one question that can be asked is why is an American soldier in uniform doing an ad for a commercial company? Well, that’s a good question but not what I’m interested in. It’s more interesting to examine the various responses to the ad and why some find it loving and inclusive and others distasteful and offensive. How you respond seems to be a matter of what sort of moral issues you are concerned with. Jonathan Haidt of course in his book Moral Foundations Theory (http://righteousmind.com) has explained how liberals and conservatives differ with respect to which moral systems they respond to. Haidt identifies six moral foundations and they are briefly: care/harm, liberty/suppression, fairness/cheating, loyalty/betrayal, authority/subversion, and sanctity/degradation. I won’t elaborate on them all for space considerations but a few insights are worthy. The care/harm distinction evolved from the need to care for children and is now stimulated by messages about suffering in distress. Compassion is a strong emotion here. For conservatives, however, that compassion is more associated with members of your own group than an outgroup. Conservatives are more likely to help members of an ingroup rather than an outgroup. For liberals, care and compassion are more universal and might be triggered by anyone suffering. There is a subtle element of this in the photograph as the soldier seems to be caring for the woman. Liberals who are more responsive to universal care are more likely to accept the photograph and find it less troublesome. The sanctity/degradation continuum is also particularly important to those with a conservative ideology. Early in our evolutionary history there was a survival advantage to avoiding human waste, decaying food, and health threats of all types. Haidt argues that many objects as a consequence became sacred and we wanted to protect them against desecration, thus setting into motion “sacred” images, flags, and words. American conservatives tend to bestow sanctity quite easily on objects such as flags, ideologies such as capitalism, and desecration on the other things such as homosexuality and foreign objects. The image of the Muslim has become contaminated and clearly by many with strong conservative ideologies seen as a threat and something to be avoided. The most conservative viewers of the photograph are the most “put off” because they see the sanctity of the American soldier being degraded by contact with an impure other. The soldier in the photograph is more sanctified than the woman and that’s why we immediately perceive his threat and express suspicion about her. So what you see and how you interpreted is certainly not an objective processing of an image, but an interpretive act that includes the interaction of your political predispositions with the object of interest. In February of 2011, over two years ago, I posted a blog with the title “Do You Really Want Islam Running the Department of Waste Management?” With the rise and now fall of Morsi in Egypt we had a chance to watch what happens when the Muslim Brotherhood or Islam is governing. It wasn’t pretty. Morsi was dumped by the Egyptian military for his autocratic and incompetent governance. Local Egyptians have been “put off” by the shortfall in fuel, electricity, and a crumbling economy. Human Rights Watch said that Morsi continued the abusive practices of Mubarak, and any number of journalists and political activists have been prosecuted unfairly. The Foundation for the Defense of Democracies reported on July 9, 2013 that apparently a document proving six-figure payments to top Muslim Brotherhood officials has surfaced. This document is important because as Islamists the Brotherhood claimed that they were more religious and had higher morals and were less subject to corruption. Morsi had apparently replaced hundreds of judges and officials with Muslim Brotherhood figures and was assumed to have adopted the political corruption of his predecessors. It’s just possible that Morsi failures signal the end of religious politics in Egypt. Much of the population is unhappy with the Muslim Brotherhood’s politicization of religion and unfair treatment of the opposition. The Egyptian Constitution is wise with respect to its principles of separation of religion and politics. Religious parties are illegal because they could not maintain the respect for the differences between religion and politics. The Muslim Brotherhood has failed to respect this principle which is crucial for democracy. Democracy through its persistent debate and contest maintains a check and balances system that is constantly responding to needs and threats posed by different groups in society. Different religious, ethical, and political groups need to have their rights met but also achieve a degree of unity. Such unity will not be found in a comprehensive political or religious system; that is, a system of fixed ideas about the universe and preference for only those who hold such ideas. In that case the political entity would be governed by a single group with the regular maximization of differences and inequality. The most successful form of unity tying pluralistic groups together is broad but not necessarily very deep. It represents a political conception of justice that is capable of including multiple groups. Hence, the logic of the European liberal experience has demonstrated that tolerance cannot be separated from liberalism. And, continuing the logic, tolerance cannot be separated from a loss of certainty. Tolerance results in a loss of faith and in the experience of at least unfreezing one’s attitudes. This is why religious groups – whether they are Muslim, Christian, or Jewish – who are highly Orthodox in their beliefs and unwavering often isolate themselves from others. They fear contamination in the form of exposure to unwanted influences. Tolerance is firmly rooted in a communication process, governed by conditions of civility and debate, which sets into motion political activity that questions one’s own certainty. One of the difficulties for the liberal state is for its members to subscribe to a shared point of view about justice and recede from religious justifications, but subscribe to this shared morality on the basis of their own religion and point of view. The key point here is that the result of discovering this common point of view or common morality is justified on moral grounds acceptable to both competing parties. As Rawls (1993) maintains, this sort of overlapping morality can only emerge from the public sphere on the basis of public reasoning. Such conditions are very alien to the religious Muslim. Not that this is required because there are ways to think about and interpret Islam in a somewhat more accommodating manner. But such is not the case for the Brotherhood. When groups or political parties form in society along religious lines they organize themselves into difficult political cleavages. And this is particularly true when the political party is radicalized and immovable with respect to consensual decision-making and tolerance for other points of view. These groups are a problem and difficult to contain but ultimately must be controlled and defeated. The United States has often taken the military and security approach but this only goes so far. You can’t kill them all. So what is a political culture like the United States to do if it is going to address these problems politically? Political Islam stresses international grievances and includes their own anger, frustration, and humiliation. Surely broad scale international relations are part of the answer: American drone attacks, the Israeli-Palestinian conflict, stability in Iraq and Afghanistan, and genuine engagement with Iran are all part of the equation that might lead to dignity and moderation. But this is not enough. These rigid authoritarian political systems, that produce frustration and violence, must be more directly confronted. In essence, these Muslim countries characterized by extremist religious parties are failing to provide economic development, political voice, and human rights. Something more direct must be done but that something must be moral and politically viable. Members of these authoritarian cultures typically report feeling humiliated and hopeless. In places like Algeria, Egypt, and Pakistan large segments of the population are young and in need of jobs as well as a sense of self-worth that comes from something other than confrontation with the West. Our military efforts in Iraq might be characterized as noble attempts to begin the process of regime change and redress of injustices heaped on the people by corrupt and authoritarian leaders. But American military presence just exacerbates the claims of imperialism and humiliation. That’s why political solutions are more important than military ones. And although no single approach or strategy will solve the problem the best way to achieve lasting change is through good democracies that protect freedom, control corruption, and have effective systems of checks and balances. These democracies cannot be what are called “illiberal” democracies; that is, democracies in name only but really have unfair elections, authoritarian leaders, and laws that limit personal freedom. 1. There is much distrust of the United States and we must restore trust by not promising more than we can deliver. 2. We have to find better ways of stabilizing political cultures than supporting authoritarian figures such as Mubarak and Egypt. Support for Mubarak was of course practical but costly in terms of trust. 3. Our knowledge of other cultures must improve. As diverse and multicultural as the United States is, we still have shallow understanding of many cultures, and Muslim cultures in particular. 4. There must be a way to talk to Islamist political parties. This is not naïve. There are some Islamist parties who do not envision a new caliphate but would prefer to accommodate others. Moreover in the era of new technology there must be more creative ways to make contact. 5. Some people, and I include myself, consider the basic tenets of democracy to be universal values. We need to use new media to broadcast these values. 6. Most of the world is highly sensitive to basic human rights and the rights of women. The argument that women should be liberated and have increased freedoms should be pressed such that cultural and legal repression is challenged wherever it occurs. Wherever possible the United States must push for transition to democracy. There are a variety of paths to democracy and different countries must move at different speeds. But principles such as the rule of law, an independent judiciary, constraints on corruption, and protection of human rights are easy enough to defend. The United States is an important player on the international scene and is in a position to intelligently and seriously push for Democratic reforms. This takes skill and nuance but it’s possible with some rethinking of how to promote democratic principles. Karagiannis and McCauley have written an excellent article on the interesting alliance between the left and political Islam. It can be found here. A summary is below. It seems that the end of Cold War has brought an end to the enmity between communism and Islamism. Indeed, there are growing signs that an informal alliance is forming between political Islam and the radical Left, both at the state level and the level of groups and movements. Tehran has reached out to left-leaning regimes in Bolivia, Nicaragua and Ecuador, offering energy and trade. Europe’s Islamists and leftists have also joined forces. In March 2012, British firebrand socialist Galloway and his pro-Hamas Respect Party scored a sensational victory in Bradford West (a heavily Muslim-populated district) by-election, gaining 55,9 percent of the vote. Although this emerging alliance may appear as a tactical marriage of convenience between two fundamentally different political philosophies opposing the West, Reds and Greens have more in common than they dare to admit. First, Islam and communism emphasize group goals over individual interests. Both seek to establish a society based on sacred texts: the Quran for the Islamists and the works of Marx and Lenin for leftists. Furthermore, they offer a vision of a just society that can be created on earth: the Marxist utopia of a classless communist society parallels the utopian vision of a restored Caliphate. Both claim to represent an absolute truth that would lead to the salvation of mankind. Both have an eschatological view of history that includes the inevitability of a final battle between good (socialist progress / Dar al-Islam) and evil (capitalist reaction / Dar al-Harb), and both can justify violence to achieve this goal. Islamists and leftists have been keen to present themselves as part of the wider anti-globalization movement. A common denominator of the anti-globalization movement is its claim that big capitalism is inherently unjust in serving the interests of Western elites to the detriment of (working and Muslim) masses around the world. It is hardly a coincidence that Hezbollah’s new manifesto, published in December 2009, spends a great deal of time attacking “an economic system that only views the world as markets that have to abide by America’s own view”. Also, leftist groups have championed the cause of anti-globalization as the preferred form of anti-imperialism. The rationale has changed but leftists’ enemies are the same. Moreover, both Islamists and leftists have portrayed the United States as the foremost imperialist power. This kind of framing resonates well for both, but for different reasons. For leftists, the U.S. involvement in the greater Middle East is outright imperialism the way Lenin described it. For the Islamists, American wars in the Middle East are just another episode in a long line of Western interventions to grab resources and land from the ummah. It is not rare to see pro-Hezbollah banners and posters of Nasrallah in leftist demonstrations in European cities. Opposition to Israel has been another common obsession for Islamists and leftists. What brings together Islamists and leftists is deep hate for what, in their eyes, Israel represents. From the Islamist point of view, the establishment of the Jewish State was orchestrated by the Christian West to steal Muslim land in a repetition of the Crusades. For leftists, Israel must be fought as Washington’s colonialist ally in the Middle East. Recognizing Israel as the keystone of the Red-Green alliance, Iran’s President Ahmadinejaz has made the Palestinian issue his ideological core. He knows that for the radical Left, from Latin America to Europe and North Korea, the Palestinians are the new Cubans—the new Vietnamese who need international solidarity. By extension, befriending Iran is a logical thing to do for anyone who supports the Palestinian cause. Much to Tehran’s delight, Venezuela and Bolivia suspended diplomatic ties with Israel following the Gaza crisis in 2009, as did Nicaragua in response to the Gaza flotilla raid in June 2010. No matter how unlikely it may seem, leftists and Islamists have come closer in recent years. Despite a long history of animosity and conflict, the two sides have joined efforts to confront the United States, Israel, and the West. Antiglobalization, anti-American and anti-Israel sentiments have provided a common framework justifying joint action for the sake of working and Muslim masses.